If you ever hear someone complain that real thrash is dead be sure to point them in the direction of Canada's Mortillery. "Origin of Extinction" is pure thrash. No additives or artificial ingredients to be found here. I first heard of this band when I covered their "Murder Death Kill" album. While that album was good this new LP finds the band making huge strides. If you want to hear proof then simply listen to the album's instrumental opener, "Battle March", where the band goes full-steam ahead into technical thrash that wouldn't be out of place on either "Ride The Lightning" or "Master Of Puppets". From there the band ends up going all in. In doing so the band, lead by the talented Cara McCutchen, ends up finding their own voice in a overcrowded field of imitators and retro thrash-loving newbies. The band still owes their existence to bands like Exodus, Anthrax, Metallica and Death Angel, but it's more like they listened to the greats, learned a few new tricks, and set about thrashing the crap out of the competition! There's no sophomore slump to be found anywhere here. One of my favorite cuts was "Seen in Death". Here you have this headbanging number that is not only thrash with all the fixings (It reminded me a bit of Slayer crossed with Lääz Rockit), but again it just comes off better then a lot that is supposed to pass for "thrash" these days. This album could end up getting passed by due to it's album art (while I dig it myself I could see others taking one look and skipping it out of fear that it was more "retro-thrash"), but that would be a tragedy. 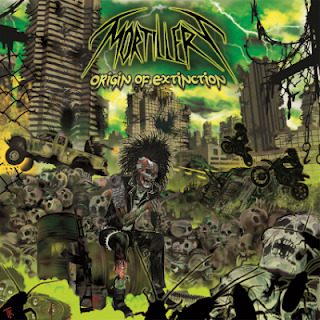 Mortillery is thrash metal for thrash metal fans and "Origin of Extinction" showcases a young band getting better with each new release. Fans of late 80's/early 90's thrash should appreciate this album. Hopefully what this five-piece band has done on album number two will simply keep repeating on album number three, number four and so on. Don't passe this one up folks.